The head of Turkish Religious Affairs Ali Erbas said Monday the Palestine and Jerusalem issue could be solved through the united efforts of the Muslim world. 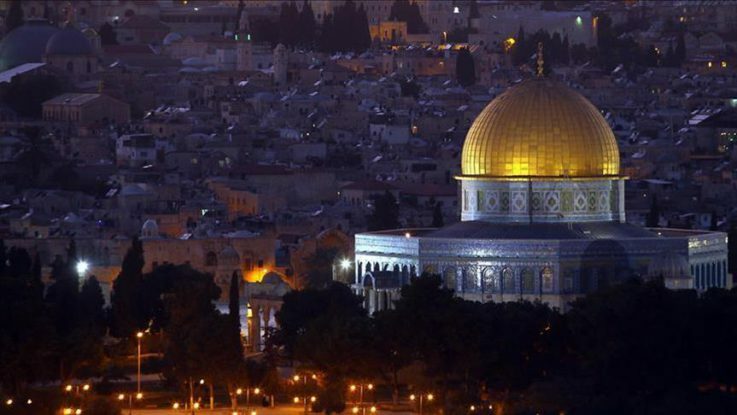 The event in Istanbul on “Jerusalem: The City Blessed by Revelation”, organized by Turkish Religious Affairs, aims to draw attention to the importance of Jerusalem in the Islamic faith and to stress the solidarity with the oppressed Palestinian people. He underlined that Israel continued its oppression of the Palestinian people and occupation of their territories with the support of the U.S. and other global powers. Erbas blamed the scattered and weak position of the Islamic communities for the situation in Jerusalem. “Islamic countries should abandon artificial contention and conflict among themselves,” he argued. “A strong and prosperous Islamic world will ensure the peace and confidence of all mankind as well as being the conscience and hope of a humanity seeking rights, law, justice and safety”, he added. Chairman of the Caucasian Muslims Office in Azerbaijan, Sheikh-ul-islam Allahshukur Pashazade vowed his support to the Palestinian cause and thanked Turkey for its support to Palestine and Jerusalem. Around 70 Muslim scholars and researchers from 20 countries, including Pakistan, Indonesia, Iraq, Jordan, Azerbaijan, Kazakhstan, Britain, France, Kenya, Somalia, and Uganda, took part in the two-day event.